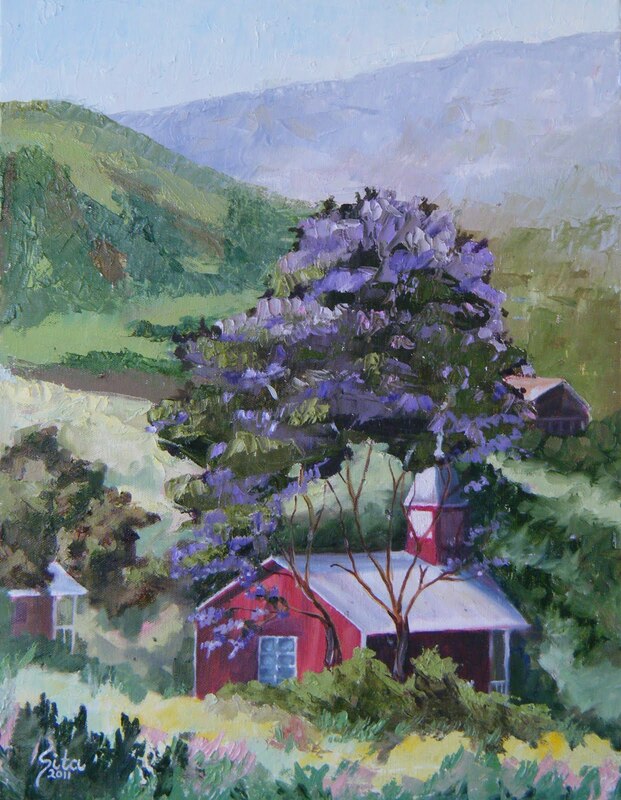 Artist's Comments: Kohala Coast Fine Art is hosting a special exhibit focused on the Jacaranda tree. Visitors to the gallery will be able to vote for their favorite painting over the entire month of July. In advance of this exhibit, I wandered the Mauka roadways in search of the perfect composition. There is a particular area of the island that is wonderful during the Jacaranda season. The small town of Pu'uanahulu not only has wonderful specimen trees but it offers such an impressive backdrop of mountains. And who doesn't think about building their home on the very top of the Pu'uanahulu Pu'u? I drove up on an early morning to capture the rising sun as it cast it rays on the small church. I wanted a nice composition that wasn't centered on the tree itself but rather offered many other subjects to enjoy. I decided to paint with the pallet knife with the exception of the church. I wanted a rustic feeling to capture the manicured feel of these wild uplands. The small church nestled amongst the foliage with Hualalai mountain receding in the distance provided me with a safe feeling; as if this is the best place on the island to be. And in the middle of all this - there was my Jacaranda tree in bloom! If you happen to be up at the King's Shops at Waikoloa in July, swing by Kohala Coast Fine Art and vote for this painting!